This page states the Terms and Conditions under which you may use this Web Sites. Please read this page carefully. If you do not accept the Terms and Conditions stated here, do not use the Web Site. MPG may revise these Terms and Conditions at any time by updating this posting. You should visit this page periodically to review the Terms and Conditions, because they are binding on you. The information on this web site is for educational, informational and private use only. At no time should information appearing on our web-site and/or e-mail correspondence be interpreted as a recommendation for our services or an endorsement of any particular product or service. MPG, or any of its employees, shall not be held responsible for lost and/or damaged digital photos that the user does not deem adequate/satisfactory. MPG is not responsible for mis-directed and/or mis-routed e-mails. MPG advises any User who wishes to send materials first contact us via email as to the content of their inquiry before forwarding materials for use on the MPG websites. Section 1. Use of Material. MPG authorizes you to view and download a single copy of the material on this Web Site solely for your personal, noncommercial use. Special rules may apply to the use of certain software and other items provided on the Web Site. Any such special rules are listed as "Legal Disclaimer" on this Web Site and are incorporated into this Agreement by reference. The contents of this Web Site, such as text, graphics, images, and other materials, are protected by copyright under both United States and foreign laws. Unauthorized use of the Material may violate copyright, trademark, and other laws. You must retain all copyright and other proprietary notices contained in the original Material on any copy you make of the Material. You may not sell or modify the Material or reproduce, display, publicly perform, distribute, or otherwise use the Material in any way for any public or commercial purpose. The use of the Material on any other Web Site or in a networked computer environment for any purpose is prohibited. Many of the photos are for illustration purposes only and are also protected by agency agreement and by the individual photographer's who have licensed their use to this site through specific use purchase agreements. No reproduction of these photos may be made. All Rights are Reserved. Section 2. Company's Liability. The Material may contain inaccuracies or typographical errors. MPG makes no representation about the accuracy, reliability, completeness, or timeliness of the Material or about the results to be obtained from using the Web Site and the Material. The use of the Web Site and Material is at your own risk. Changes are periodically made to the Web Site and may be made at any time. All offers are subject to change without notice and may not be updated on the website at the same time the changes are made to the general public at MPG or other location providing support or sales for the company's products or services. MPG DOES NOT WARRANT THAT THE WEB SITE WILL OPERATE ERROR-FREE OR THAT THIS WEBSITE AND ITS SERVER ARE FREE OF COMPUTER VIRUSES AND OTHER HARMFUL GOODS. IF YOUR USE OF THE WEB SITE OR THE MATERIAL RESULTS IN THE NEED FOR SERVICING OR REPLACING EQUIPMENT OR DATA, MPG IS NOT RESPONSIBLE FOR THOSE COSTS. THE WEB SITE AND MATERIAL ARE PROVIDED ON AN 'AS IS' BASIS WITHOUT ANY WARRANTIES OF ANY KIND. MPG AND ITS SUPPLIERS, TO THE FULLEST EXTENT PERMITTED BY LAW, DISCLAIM ALL WARRANTIES, INCLUDING THE WARRANTY OF MERCHANTABILITY, NON-INFRINGEMENT OF THIRD PARTIES RIGHTS, AND THE WARRANTY OF FITNESS FOR PARTICULAR PURPOSE. MPG AND ITS SUPPLIERS MAKE NO WARRANTIES ABOUT THE ACCURACY, RELIABLITY, COMPLETENESS, OR TIMELINESS OF THE MATERIAL, SERVICES, SOFTWARE, VIDEO, MULTIMEDIA, TEXT, GRAPHICS, AND LINKS. Section 4. User Submissions. Generally, any communication which you post to the Web Site is considered to be non-confidential. If particular Web pages permit the submission of communications which will be treated by MPG as confidential, those pages will be in a secure documents folder with the prefix beginning https. For non-confidential information you may post to the Web Site, you automatically grant MPG a royalty-free, perpetual, irrevocable nonexclusive license to use, reproduce, modify, publish, edit, translate, distribute, perform, and display the communication alone or as part of other works in any forms, media, or technology whether now known or hereafter developed, and to sublicense such rights through multiple tiers of sublicenses. All confidential postings, forms and other information gathered is covered under the separate PRIVACY NOTICE following these WEB SITE USE notes. MPG does not represent nor guarantee the truthfulness, accuracy, or reliability of any of communications posted by other Users or endorse any opinions expressed by Users. You acknowledge that any reliance on material posted by other Users will be at your own risk. MPG does not screen communications in advance and is not responsible for screening or monitoring material posted by Users. If notified by a User of communications which allegedly do not conform to this Agreement, MPG may investigate the allegation and determine in good faith and its sole discretion whether to remove or request the removal of the communication. MPG has no liability or responsibility to Users for performance or nonperformance of such activities. MPG reserves the right to expel Users and prevent their further access to the Web Site for violating this Agreement or the law and the right to remove communications which are abusive, illegal, or disruptive. There are no methods for direct posting, such as a guestbook or other avenue available to the general public as of February 1, 2009. All submissions, i.e. Questions, are reviewed for appropriateness and may or may not be included on our Web Site. All decisions made by MPG regarding content are final. No submission of any material should be construed as a guarantee that said material will be posted or even warrant a response. No accepted submission shall constitute the basis for any future submission by any party. Section 5. Links to Other Sites. The Web Site contains links to third party Web sites. These links are provided solely as a convenience to you and not as an endorsement by MPG of the contents on such third-party Web sites. MPG is not responsible for the content of linked third-party sites and does not make any representations regarding the content or accuracy of materials on such third-party Web sites. If you decide to access linked third-party Web sites, you do so at your own risk. Section 7. Limitation of Liability. Unless otherwise expressly provided in a Software License or Legal Notice, the aggregate liability for MPG to you for all claims arising from the use of the Materials (including software) is limited to $1. Section 8. Indemnity. You agree to defend, indemnify, and hold harmless MPG, its officers, directors, employees and agents, from and against any claims, actions or demands, including without limitation reasonable legal and accounting fees, alleging or resulting from your use of the Material (including Software) or your breach of the terms of this Agreement. Section 10. User Information. MPG may use the information it obtains relating to you, including your IP address, name, mailing address, email address, personal data, address, phones, other details listed on our online forms, and use of the Web Site, for its internal business and marketing purposes, but will not disclose the information to third parties. No outside person or service will contact you in regards to our services. If a User is approached regarding our services by anyone other than the owner, please contact MPG immediately. Section 11. General. This Web Site is based in Texas. MPG makes no claims the Materials are appropriate or may be downloaded outside of the United States. Access to the Materials (including Software) may not be legal by certain persons or in certain countries. If you access the Web Site from outside of the United States, you do so at your own risk and are responsible for compliance with the laws of your jurisdiction. This agreement is governed by the internal substantive laws of the State of Alabama, without respect to its conflict of laws principles. If any provision of this Agreement is found to be invalid by any court having competent jurisdiction, the invalidity of such provisions shall not affect the validity of the remaining provisions of this Agreement, which shall remain in full force and effect. No waiver of any term of this Agreement shall be deemed a further or continuing waiver of such term or any other term. Except as expressly provided in a particular "Legal Notice" or Software License or material on particular Web pages, this Agreement constitutes the entire Agreement between you and MPG with respect to the use of Web Site. Any changes to this Agreement must be made in writing, signed by an authorized representative of MPG. Warranty Coverage. MPG does not offer warranty coverage. Manufacturers may offer a warranty for a particular product. Please check with each manufacturer regarding the details of their warranty. All warranties must be in writing and delivered by the manufacturer to the consumer. Do not rely on any representation about the products or services offered online or on-site by anyone except duly authorized company representatives, who will supply all claims of warranty in writing to the consumer at the time of purchase. No other claims are valid. All consumers should read the full privacy notice. What Personal Information About Customers Does MPG Obtain? * Information You Give Us: We receive and store any information you enter on our Web site or give us in any other way. You can choose to omit certain information, but you might not be able to use many of the MPG features. We use the information that you provide for such purposes as responding to your requests, customizing future shopping for you, improving our service, and communicating with you. * Automatic Information: We receive and store certain types of information whenever you interact with us. For example, we use "cookies," and we obtain certain types of information when your Web browser accesses MPG. Various companies offer utilities designed to help you visit Web sites anonymously. Although we will not be able to provide you with a personalized experience at MPG if we cannot recognize you, we want you to know these tools exist. * E-mail Communications: To help us make e-mails more useful and interesting, we often receive a confirmation when you open e-mail from MPG if your computer supports such capabilities. We also compare our customer list to lists received from other companies, in an effort to avoid sending unnecessary messages to our customers. If you do not want to receive e-mail or other mail from us, please let us know. * The Help portion of the toolbar on most browsers will tell you how to prevent your browser from accepting new cookies, how to have the browser notify you when you receive a new cookie, or how to disable cookies altogether. However, cookies allow you to take full advantage of some of MPG's features, and we recommend that you leave them turned on. Does MPG Share Information About You? Information about our customers is an important part of our business, and we do not sell it to others. We share customer information only as described below and with subdivisions of MPG. These divisions are subject to this Privacy Notice or follow practices at least as protective as those described in this Privacy Notice. * Affiliated Businesses We Do Not Control: Since we have links which put the user into other company websites which we do not control, we recommend reading their individual privacy notices. These other companies may employ practices which are more or less restrictive than those which we use at MPG. 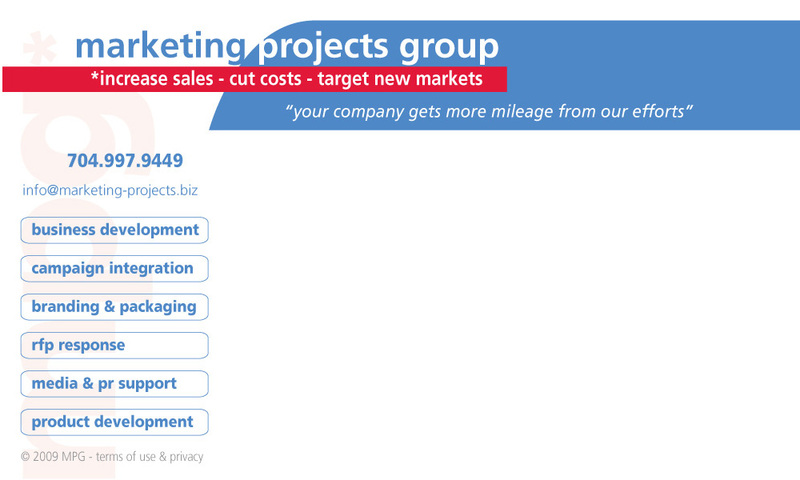 * Agents: We employ other businesses and individuals to complete tasks for MPG. Examples include fulfilling orders, delivering packages, maintaining servers and computer systems, printing account cards, distributing vendor and consumer kits, sending postal mail and e-mail, removing repetitive information from customer lists, analyzing data, providing marketing assistance, providing search results and links (including paid listings and links), processing credit card payments, and providing customer service. They have access to personal information needed to perform their functions, but may not use it for other purposes. * Promotional Offers: At this time MPG has no plans to produce promotional offers and will not use your information for this purpose either in-house or in conjunction with other companies. This clause is subject to change at any time at the sole discretion of MPG. * Protection of MPG and Others: We release account and other personal information when we think it is appropriate to comply with the law; enforce or apply our Conditions of Use and other agreements; or protect the rights, property, or safety of MPG, our users, or others. This includes exchanging information with other companies and organizations for fraud protection and credit risk reduction. Of course, this does not include selling, renting, sharing, or otherwise disclosing personally identifiable information from customers for commercial purposes in violation of the commitments set forth in this Privacy Notice. * Business Transfers: As our business grows, we might sell or buy interest in vendors, subsidiaries, or business units. In such transactions, customer information generally is one of the transferred business assets but remains subject to the promises made in any pre-existing Privacy Notice (unless, of course, you consent otherwise). Also, in the unlikely event that MPG, or substantially all of its assets are acquired, customer information will of course be one of the transferred assets. * We reveal only the last digits of your credit card numbers when confirming an order. We must transmit the entire credit card number to the appropriate credit card company during order processing, but this information is encrypted using state-of-the-art security procedures. * It is important for you to protect against unauthorized access to your password and to your computer. Be sure to sign off when finished using a shared computer. If you visit a library or are using a computer which has multiple users, please remember to close your session by properly logging out. Then close the browser. MPG gives you access to information about your account and your interactions with MPG for the limited purpose of viewing and, in certain cases, updating that information. Depending on your status - consumer, account holder, vendor or merchant - the information you can access, alter and view will vary. * As discussed above, you can always choose not to provide information, even though it might be needed to make a purchase or sign you up for registrations or offers. By choosing not to provide your information the functionality of our site will be greatly affected. * When accounts exist for personal access, you may be able to add or update certain information in your account. When you update information, we can keep a copy of the prior version for our records. Sometimes we may contact you in written communications via regular postal mail to confirm changes to your account. * If you do not want to receive e-mail or other mail from us you may opt out of such transmissions, however, if you do not want to receive Conditions of Use and other legal notices from us, such as this Privacy Notice, those notices will still govern your use of MPG, and it is your responsibility to review them for changes. MPG does not sell products for purchase by children. If you are under 18, you may use the MPG website only with the involvement of a parent or guardian. If you choose to visit MPG, your visit and any dispute over privacy is subject to this Notice and our Conditions of Use, including limitations on damages, arbitration of disputes, and application of the law of the state of North Carolina. If you have any concern about privacy at MPG, please contact us with a thorough description, and we will try to resolve the issue. Since MPG changes constantly, our Privacy Notice and the Conditions of Use may also change. We may e-mail periodic reminders of our notices and conditions, unless you have instructed us not to, but you should check our Web site frequently to see recent changes. Unless stated otherwise, our current Privacy Notice applies to all information that we have about you and your account. We stand behind the promises we make, however, and will never materially change our policies and practices to make them less protective of customer information collected in the past without the consent of affected customers. You provide most such information when you search, buy, or communicate with customer service. For example, you provide information when you search for a product; inquire about a rental; place an order through MPG; communicate with us by phone, e-mail, or otherwise; or provide employer information when opening a business account. Due to those actions, you might supply us with such information as your name, address, and phone numbers; credit card information; people to whom purchases have been shipped, including addresses and phone number; e-mail addresses of other people; and financial information, including personal identifiers. Examples of information we receive from other sources include updated delivery and address information from our carriers, which we use to correct our records and deliver your next purchase or communication in a timely fashion; account information, purchase or redemption information, and page-view information from some merchants with which we have agreements or for which we provide technical, fulfillment, advertising, or other services; search term and search result information from some searches conducted through search features; search results and links, including paid listings; and credit history information from credit bureaus, which we use to help prevent and detect fraud. Examples of information you can access at MPG vary with the type of account you may have. The information accessible may include up-to-date information regarding recent orders; personally identifiable information (including name, e-mail, password, communications and preferences); payment settings (including credit card information); e-mail notification settings; shopping lists. This concludes our Privacy Notice, amended February 1, 2009.